If you’ve got the basics in your pantry—extra-virgin olive oil, garlic, Italian-seasoned bread crumbs, Parmesan cheese plus good Parmigiano-Regianno, pasta, red pepper flakes, and canned tomato sauce—you shouldn’t have to buy much else other than chicken, provolone, your vegetable, and flat-leaf Italian parsley (for jazzing up your pasta). Two whole chicken breasts (or four halves, depending on how you tend to size things up) formed the foundation for this dinner. I started the day before by preparing my breaded chicken cutlets; all I needed to do to serve it the day was assemble and cook the recipe, make my pasta with garlic and olive oil, and roast the asparagus. A crusty baguette and a bottle of wine rounded out the meal. Delizioso! Slice the breasts down the middle, then slice off the side end of each half-breast so that each piece lays flat on your cutting board. With a meat mallet, gently pound each piece of chicken until the pieces are about one-half inch thick. Season the chicken with salt and pepper. Whisk the eggs and add the minced shallot. Blend the bread crumbs and cheese together on a baking sheet. 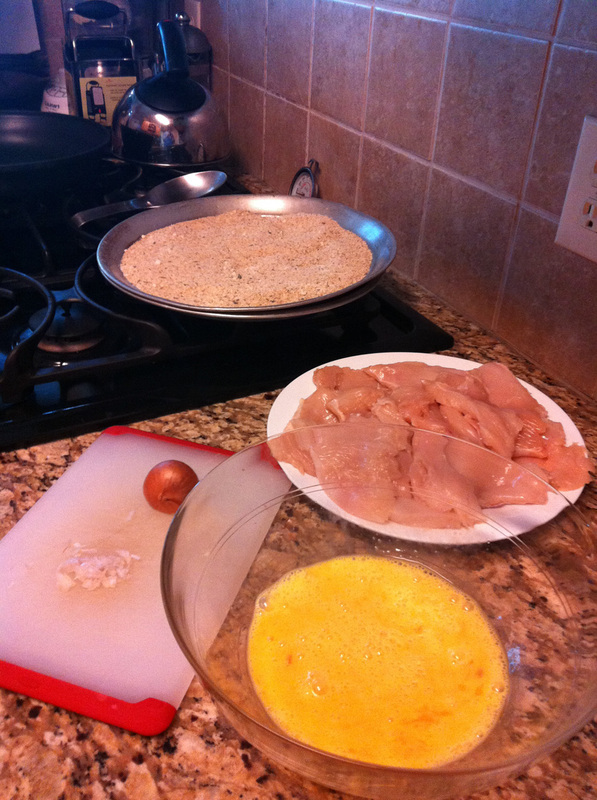 Dip each piece of chicken in the eggs, then dredge in the crumb and cheese mixture. 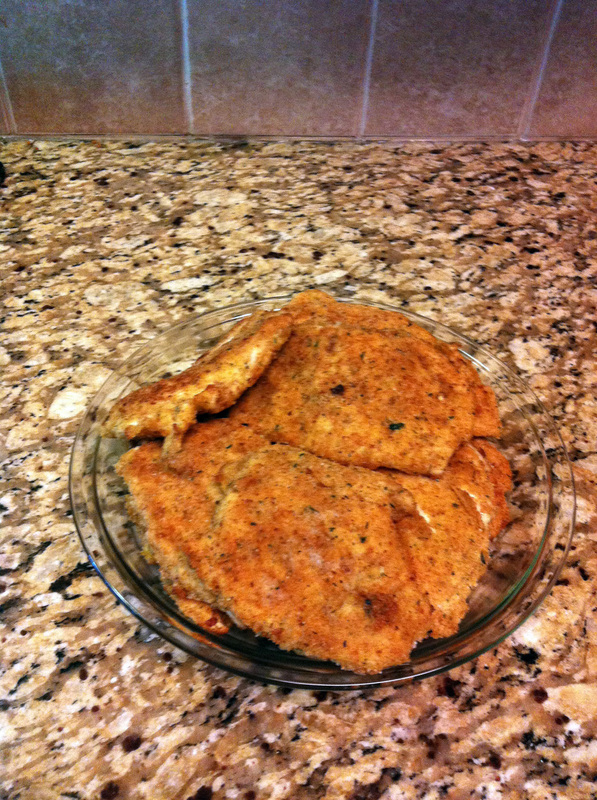 Place each breaded chicken piece on a separate baking sheet and continue until all of the chicken has been breaded. Heat 3 tablespoons of olive oil in a large skillet over medium-high heat. Add the cutlets and cook until they are golden brown, about 2 to 3 minutes per side. Add extra oil to the skillet as needed. You’ll likely have to cook the cutlets in batches; after each cutlet is cooked, remove it to a tray or plate lined with paper towels. When finished, you can either cover the cutlets with aluminum foil and store until the next day, or continue with the recipe. Preheat the oven to 475-degrees F. Spread some of the tomato sauce on the bottom of a 9 x 13 baking pan, then arrange the breaded chicken cutlets on top, adding more sauce in between each cutlet. 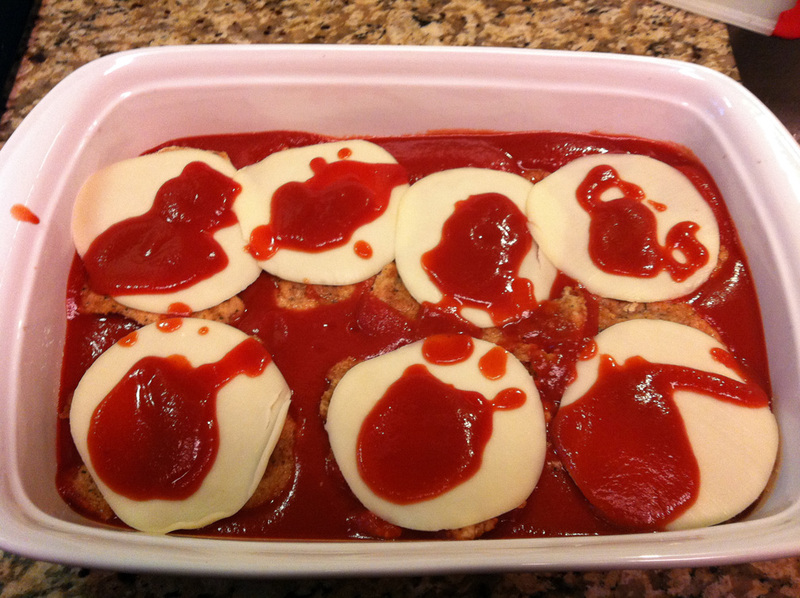 Top each cutlet with a slice of Provolone cheese, then add a dollop of sauce to the cheese. Sprinkle the Parmigiano-Regianno over all. Bake until the cheese melts and the chicken is cooked through, about 10 minutes or until nice and bubbly. Serve immediately. A very satisfying meal…a perfect combination of flavors. Hi Karen! Thanks so much for visiting my blog, and for your comment. I have to tell you: John and I ate this meal for three days straight and were sad when it was all gone—it was that delicious. Thanks again! That looks SO good! 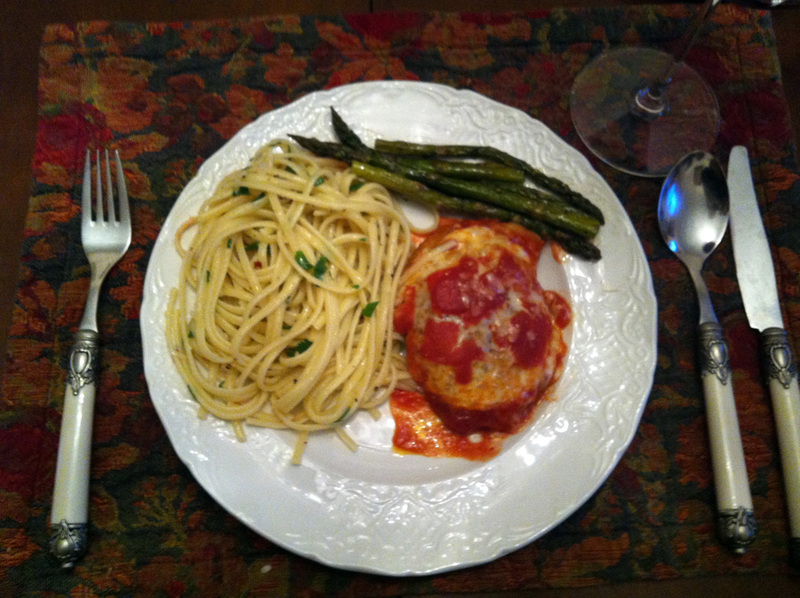 I LOVE LOVE LOVE Chicken Parmesan. I like how you dipped the chicken into the eggs and then into bread crumbs to make that yummy crust. Thanks Indira. Not sure if you’ll be able to find seasoned Italian bread crumbs in Russia, but I’m sure you can improvise! Just don’t forget to add the Parmesan cheese! Thanks for including this in your list of related articles!